Now collected into one stunning hardcover! "A moody masterpiece of fiction that is all the more compelling because every word of it could be true. [Uses] a broad visual palette that matches its dramatic variety of emotions." 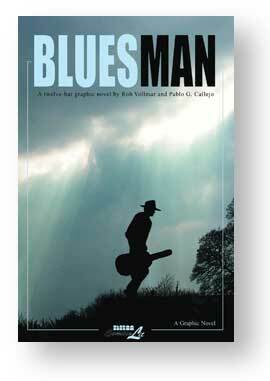 The first graphic novel by the best-selling team of “Bluesman.” An emotionally powerful tale, drawn from the fabric of America itself, that follows the adventures of young Tucker Freeman as he is compelled to hop a train to escape from the crippling poverty of his rural existence. Armed with only fifteen cents and the memory of his occasional hobo father’s counsel, Tucker must find his place in this broken America of the Great Depression before the realities of being young, poor, and homeless consume him. 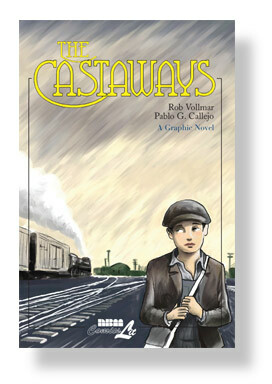 This new NBM/ComicsLit edition of THE CASTAWAYS features a six page conclusion/epilogue not featured in the original release as well as a new two-color look, and will stand as THE definitive edition of a book nominated for an Eisner in the Best Single Issue/One Shot category in 2002. An epic adventure recalling the works of Mark Twain, Jack London, and John Steinbeck. "An attractive expanded and color-enhanced version. Vollmar's script, based on family reminiscenes, rings true. Callejo's art creates a solid setting in which Tucker's experience can reveal squalor or grace."